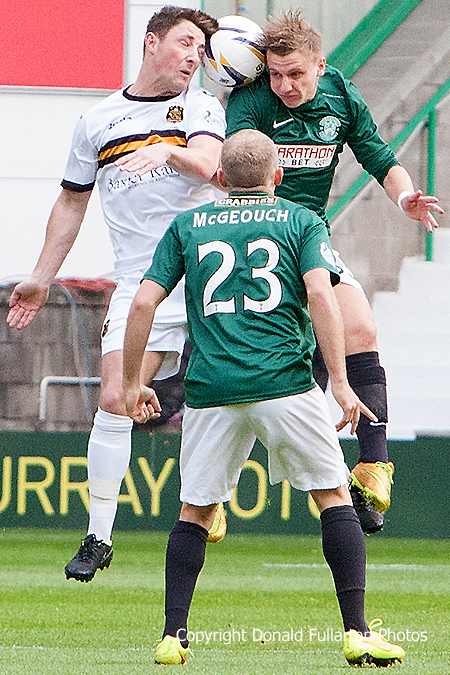 DUMBARTON completed the first quarter of the SPFL Championship with a hard-fought draw against Hibernian at Easter Road. DUMBARTON completed the first quarter of the SPFL Championship with a hard-fought draw against Hibernian at Easter Road in front of a 7913 crowd. Hibs had most of the pressure and it took stout defending and some great saves from keeper Danny Rogers — just back from winning his first Republic of Ireland under 21 cap — to foil the Edinburgh side. The point extended Sons unbeaten run to six games and took their tally to ten points, their target for the first quarter. Sons best opportunity came when Colin Nish almost floated in a header from a long throw from Scott Linton, while Jordan Kirkpatrick came close with a shot. At the other Hibs kept pressing, and they eventually won a dubious penalty late in the half when Dominique Malonga claimed he was pulled back in the box by Andy Graham. Keeper Rogers had no trouble in stopping a weak spot kick from Malonga, but then almost let the ball cross the line as it slipped behind him. But both the linesman and the referee — not to mention nearby Sons fans — were satisfied that the ball had not completely crossed the line. In the second period the visitors were more of an attacking force, with big striker Nish, a determined defender when necessary and having his best game yet for Dumbarton, having the best chances. He had two good strikes and an overhead kick, but could not find the net. Kirkpatrick — pictured in an aerial duel — also had an excellent shot saved, relieving the still constant pressure at the other end. Eventually, after six minutes of injury time, the final whistle blew on a scoreless but entertaining match. As they left the field the exhausted Sons players applauded their faithful band of travelling fans.